Lord of Arcana is an old-school Japanese RPG adventure that sees a powerful hero stripped of everything... memory, fighting prowess, weapons and magic... With no memories of their previous life, the hero find themselves in the village of Porto Carillo where you must fight your way back to the top in order to become one with the power called Arcana and more particularly, the Lord of Arcana. The heart behind the game requires the player to go from a humble commoner with slight delusions of grandeur to powerful hero in order to vanquish the realm from all sorts of nasty evils. Your goals are simple, embark on a variety of quests for NPC's and slaughter your way to the top. It's classic RPG lore. Before starting the game, Lord of Arcana has an in-depth character creation tool that allows you to fine tune your gaming avatar from appearance to all sorts of non-essential facets. Although it does give you some good character creation options for looks, it is a little clunky on the PSP format but nonetheless, it does allow you to give your character that personal touch. With some pre-rendered cutscenes along the way, the game reminds me of Monster Hunters as you speak to the Slayer's Guild in order to choose a mission. As opposed to a free roaming RPG, you basically appear in the area where you quest takes place, whether it's a dark and musty dungeon or the mysterious Neumellow woods, the variety of locales is actually quite good that does help keeps things fresh and unique. To throw a spanner in the works, there is a timer involved in your quests that had me cursing profanities at my PSP on more than one occasion. For example, I almost completed a quest and then BANG... the timer ran out and all my work was for naught. In one sense, I can understand the need for a timer but for me, this old school method is more of a cattle prod to the player which I'm not a huge fan of. Apart from exploring the limited segments of this world, combat is the true heart of Lord of Arcana. Combat is a little bit of a mixed bag due to the limited nature of options available to the player. The combat in Lord of Arcana can be quite diverse at times but you need to give the game plenty of gaming hours in order for this happen. Essentially it's a button masher. At the start, it is a little repetitive as are some of the monsters you fight like Goblins and the undead, however as you progress, these monsters do become more challenging, especially the boss fights that can be quite tricky. The best part of combat are the finishing moves that allows you to hack 'n slash your foes with a final majestic blow... quite gory and bloody. Each of the monsters you challenge fight systematically and you will soon discover a pattern which is vital when fighting bosses. 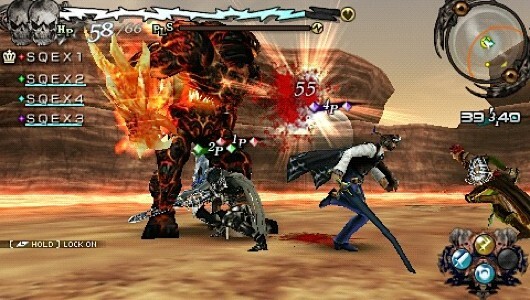 At times, the fights with the bosses remind of God of War, due to the implementation of the similar quick-time events. It's kind of cool. There are five weapons available in Lord of Arcana, each with their pros and cons. For me, the one-handed sword was my weapon of choice, due to its speed and the ability for my character to wield a shield. The pole arm was fun as was the two handed sword but unfortunately they were a little slow but the damage they could inflict was quite impressive. Apart from melee weapons, there are some projectiles available, depending on what you specialise in. As you progress, your character slowly becomes more powerful as you "level" up in different attacks and learn new magic. The buttons have been mapped on the PSP controller well, although I must admit that I'm getting rusty using my PSP due to the lack of games being released on it and that smart phones are so much more easier. Even so, the control of your character, navigation, menus and combat works well. The only issue with the controls is the lock-on system that requires you to look at the monster as opposed to an automatic locking system. This gets frustrating when there are more than one monsters around. All in all, the gameplay is a little average due to the inconsistencies. Apart from a slightly average gaming experience, Lord of Arcana supports a multiplayer mode. Unfortunately it's only local multiplayer which allows up to 3-gamers to play. It's a shame that there is no online support because it would have made the gaming experience a lot more enjoyable and accessible to more players. Unfortunately I could not test this feature with only one copy of the game. 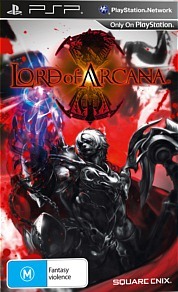 Graphically, Lord of Arcana is a relatively good looking game that at times, this look a little dated on the PSP compared to some other recent releases of a similar genre. Needless to say, the characters are well animated and there are some nice textures employed into the game. The developers have made good use of the PSP architecture in terms of lighting, special effects and some of the background environments are very detailed in terms of population with items. The only drawback with the graphics are the sometimes longer than long loading times that is a little frustrating, especially if you want to jump straight into the game. Music is the traditional RPG soundtrack that works well as do the sound effects in the game and once again, headphones are a must for this game. 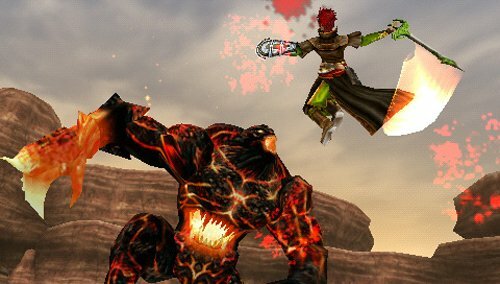 In the end, Lord of Arcana doesn't break out of the traditional RPG formula and has quite a few parallels with Monster Hunter, although Monster Hunter was far superior in terms of an overall gaming experience. I'm not saying that Lord of Arcana is a bad game, it's just gives you that same feeling that you've done it all before which is good for people who enjoy this genre but not for those wanting something new. Monsters are diverse, levelling your character is enjoyable but combat does become a little repetitive and too "grindish". However, I did enjoy those damn boss battles that does make you think but with the inclusion of a timed quests... what a horrible experience. With games dwindling on the PSP, there's not much to look out for but if you want an intuitive yet "fun" RPG, you might want to rent before you buy this title.